Georgetown, the capital of Guyana, is almost fairytale-like in appearance thanks to tree-lined streets and avenues and quaint Dutch colonial and Victorian architecture stemming from its days as a Dutch and an English colony. Georgetown lies below the high-tide level, protected by a seawall with a series of canals crisscrossing the city. When rains are heavy, flooding, as occurred in early 2005, is a risk. 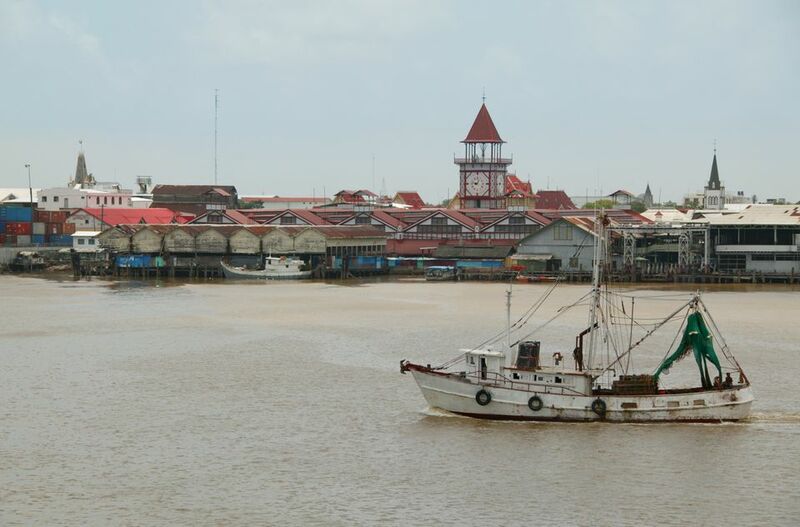 Located on the mouth of the Demerara River fronting the Atlantic Ocean, Georgetown, originally called Stabroek, was an ideal location for a European presence in the Caribbean. Rich in timber, bauxite, gold, and diamonds, the land supported sugar cane plantations and enriched the colonial governments. The Spanish, Dutch, French, and English all had their eyes on this region, and each struggled to possess it for years. The Dutch initially gained the upper hand and established Stabroek on the lines of any tidy, Dutch city. The British occupied the Dutch colony in 1812 during the Napoleonic Wars and renamed the capital, and largest city, Georgetown in honor of George III. This was convenient for the British who were also fighting what they termed the “American War,” known in the US as the War of 1812. British Guiana, as it was then called, was the center of border conflicts with its neighbors, Venezuela and Suriname. These conflicts continue, making it difficult to travel between these countries without first passing through another. International flights from the US or Europe fly into Georgetown's Cheddi Jagan International airport mainly via Trinidad, Bogotá, or other locations in Colombia. Getting to Guyana by boat is an adventure the Guyanese tourist board hopes to encourage. Getting around in Guyana is mostly by road, river, and air. There are a number of hotels, resorts, and interior resorts and lodges to choose for your accommodation needs. The weather and climate may affect your travel plans, but they maintain the interior forests and river systems that Guyana is developing for ecotourism. Guyana has immense falls, vast tropical jungles, and savannas teeming with wildlife. Called the "land of many rivers," Guyana's interior is best reached by riverboat. There are almost 1000 km of navigable rivers to enjoy. Before your trip, check the current weather conditions and the 5-day forecast. Places to see include attractions in Georgetown as well as in other cities and the interior of the country. Note the unique features of the local architecture, such as the lovered shutters with window boxes and the combination of Dutch and English touches. St. George's Cathedral - reputed to be one of the world's tallest wooden buildings. Its spire rises over 132 feet. The Walter Roth Museum of Anthropology - housed in an elegant wooden building and displays an interesting collection of artifacts and relics of Amerindian culture. St. Andrews Kirk - built it 1829, it is the oldest building continually in use for religious purposes. Museum of Guyana - exhibitions of Guyanese paintings and sculpture. Umana Yana - erected by the Wai-Wai Indians for the Foreign Ministers' Conference in August 1972, this palm-thatched structure is now an honored attraction. Umana Yana is an Amerindian word meaning "meeting place of the people." Liberation Monument - on the Umana Yana grounds, dedicated to the struggle for freedom everywhere. The Botanic Gardens - with Victorian bridges, pavilions, palms, and tropical flora, including the huge lily pads of the Victoria Regia Lily, Guyana's national flower, first discovered in the Berbice River and named for Queen Victoria. Parliament Building - built in 1833 in a neo-classical style. Here, Guyana's emancipated slaves purchased their own land for the first time. Parliament still meets here and was addressed by Queen Elizabeth during her state visit in February 1994. Old Stabroek Market - historic cast-iron building with a striking clock tower offers a wide variety of goods but is unfortunately known for its muggers. Be careful. Kaieteur Falls - on the Potaro River, a tributary of the Essequibo River, the falls flow over a sandstone table and drop 741 feet into a deep valley. Five times the height of Niagara, the falls vary in width from 250 feet in the dry season to 400 feet at the height of the wet season. The falls are difficult to reach, but several tour agencies in Georgetown offer 4-day trips. River Trip to Bartica - the river taxi by bus, ferry, or speedboat. You'll cross the very long pontoon bridge on the Demerara river and perhaps take the ferry boat loading bananas and vegetables back to Georgetown. Shell Beach - see endangered giant sea turtles on one of Guyana's few beaches. Timberhead Resort - rainforest resort near the bank of the Demerara River, reached by the river through Amerindian villages, forested areas, and savannas. Queen Elizabeth and US President Jimmy Carter have stayed here.